Big savings. That's the promise of factory rebates and incentives. Our Payment Wizard will show you exactly how much you can save on your new 2019 Chevrolet Colorado whether you get cash back, a low APR loan or a lease. Just select the style and particular incentive for your 2019 Chevrolet Colorado — and we'll show you how much you can save. 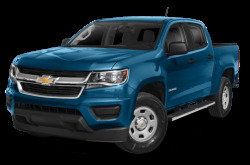 Saved... For the next 6 months, we'll send you an email when new rebates or incentives are announced for the 2019 Chevrolet Colorado.